My daughter has a friend whose birthday is coming up soon and we needed a gift. Her friend loves reading books, so we thought a little bag that she could carry a couple of books or her Kindle would be a perfect gift! I found this post from Crazy Little Projects and decided that with a bit of changing of the pattern and adding a few extra things, we could make the perfect little bag! So our very own pattern and the Mini Messenger Bag tutorial was born! *This bag is just the right size for a smaller Kindle (affiliate link). It is just a little bit too small for the bigger Kindles (affiliate link). *I used a 3/8 inch seam allowance throughout this tutorial. First, print out the 3 pattern pieces. Cut out each one and tape together the flap and the back pieces along the dashed line. Now it is time to cut out your fabric pieces! All 3 pattern pieces cut out. Tape Back and Flap pieces together along dashed line. Now you’re ready to cut your fabric! On the fold, cut out 1 front pattern piece from each of the fabrics. Then, on the fold, cut 1 back/flap pattern piece from each of the fabrics. At this point, you should have 4 pieces. Then cut the fabric for your strap. I cut the strap 3 inches wide by the whole length of the fabric (which is about 45 inches), but you can cut it shorter if you want. Cut one of those from both of the fabrics. So, now you should have 4 pieces of fabric, 2 pieces of interfacing, and 2 pieces for the strap. …and sew down each side. Then flip the strap right side out. I like to use a big safety pin for this part. Then iron it and make it look nice. Then top stitch down both sides. Now the strap is all finished and we can move on to the most exciting part, the bag! First, we are going to attach the interfacing. Place the interfacing shiny side up onto your ironing board. Then place your outer fabric pieces onto the interfacing with the right sides facing up. Then iron. I like to put a thin cloth over top while I iron so that none of the sticky fusible stuff comes off on my iron! *Please follow the directions that came with your interfacing. Mine might be a little bit different. Now, place your outer back/flap piece down with the right side facing up and place the outer front piece down with the right side facing down. Now do the same thing with the inner fabric. Lay the fabric right sides together. And then sew around the bottom section, leaving 1/2 inch unsewn at each end. Now it is time to work on the button. I bought my magnet buttons at Joann a few years ago. They came in a pack of three and I had some leftover from another project. I’m guessing they are still the same now? Anyway, the ones I have have two little prongs on the back. This is what they look like. So, we need to measure where we want our buttons to go, cut two little slits in our fabric, insert the buttons, and then bend the prongs back to secure it to the fabric. Then insert the button into the slits and bend the prongs to secure it to the fabric. Now we’ll put the button on the inside. Measure about 1 1/2 inch down from the top and center of the inside fabric. Make your two little slits again. And insert the button and bend back the prongs. All finished with the buttons! Now sew along the top/flap section. Take care not to sew any of the front pattern piece when you are doing this part. Let me show you what I mean with a fancy little drawing. And then it will look like this on the other side. Now turn the flap part right side out and the outer bag part right side out and then you should be able to tuck the lining fabric into the outer fabric. Then iron it all to make it look nice. Now we’re going to top stitch around the flap part and sew a line down the middle, where the flap will fold down. Now, insert your straps in between the inside and outside fabric. Then fold down the edges of the inside and outside fabric and pin. Then sew along where you pinned so that your straps are attached and the inside and outside fabric are sewn together. And now it’s all finished! Doesn’t it look great?! And a big thank you to my little model! She is sure excited to give this Mini Messenger Bag to her friend! Let me know if you have any questions. This is the first time I’ve done something like this and I would love to help you out! It sounds like an easy tutorial for a really sweet messenger bag. I’m thinking it may work splendidly as a diaper clutch for my sister-in-law. Thank you. Thanks for your comment Bethany. I think it would work great as a diaper clutch! You’re sister-in-law is lucky to have you thinking of her! Thanks for stopping by. Such a good tutorial. You did a great job with the instruction and photos. Nice bag! Thanks for the nice comment! And thanks for visiting my blog! This is a great idea! I love the tutorial with detailed pictures! Thanks for your nice comment Crystal! Awesome tutorial! My daughter is just learning to sew so I’ve pinned this for a fun project for her in the future! 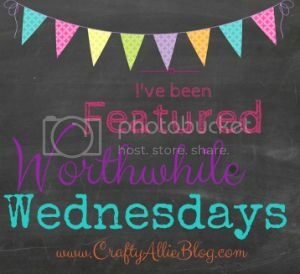 Thanks for linking up with Waiting on…Wednesday @ While I’m Waiting! Thanks for all the nice comments Holly! I think this would be the perfect project for your daughter! Very cute!! Pinning it to my sewing board. Stopping by from Frugal Friday. Have a great weekend! Thank you! And thanks for pinning the tutorial. I really appreciate it! How adorable! Pinned and I can’t wait to make this! Thanks Mandi! I hope you love yours! Very cute! Now I just need a sowing machine 🙂 ps. great to connect through the blog party at MomResource! Awesome tutorial! I think even I could make this with your instructions! 🙂 Thanks for sharing at Bloggers Brags. You’ve been pinned! Thanks for all the nice comments Christie! I really appreciate them! Thanks! I know if I can do it then you can too! Loved this tutorial and the bag. What are the finished dimensions of the bag. I need one that is a medium size….and would love to use your tutorial to make it……Really inspired me to get it done. The finished bag is about 11 1/2 inches wide by 7 1/2 inches tall! Hope that helps! Let me know if you have any other questions! Beautiful! You really inspire me to use my sewing machine more. Thanks for linking this up to Share the Wealth Sunday. Great bag! Thanks for the tutorial. Your tutorial is awesome and the bag is adorable! I would love for you to link up at the Stitch It, Blog It, Share It Link Party going on now at behindtheseamssewing.com. What a brilliant tutorial, such clear photos. I am SO putting this on my to do list!